THE SKINNY: I had really high hopes for this product and that it would beat the cold, dry-air hair static that has been plaguing me for months. It helped, but did not eliminate the problem. 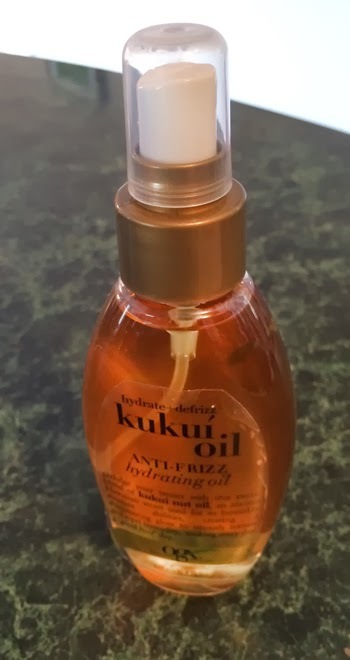 Organix Kukui Oil is design to hydrate hair, block humidity and add sine and sheen. It was ok, but overall just an average product. Maybe I am just using it the wrong time of the year ... I will pull this back out in the more humid summer months. I am still on the hunt for a great finishing spray. If you know of one, please let me know in the comments! KEEP OR TOSS: Keep, but it is unlikely that I will buy it again. CHECK IT OUT: Generally, the Organix line has been one of my favorites and it is almost always on sale at Ulta.